Before becoming a parent, I think we all have this dream of how it’s going to be when we have a kid. I seriously thought that I would have some velvet clad children or something…yeah I know, delusional. Anyways, things never go the way they are supposed to with a baby in the equation, so I present you today with Naptime With Sweet Pea. Sweet Pea is not a napper. Apparently, she is of the mind that there are so many cool things going on here that she cannot be bothered with sleeping. Crazy, right? Well, it seems crazy to me. It’s pretty boring here most days. We are usually trying to get school work done in the mornings, and when I am not taking care of the baby or helping with school, I am trying to get a bit of work done (which seems totally futile lately). However, we did find one thing that works. 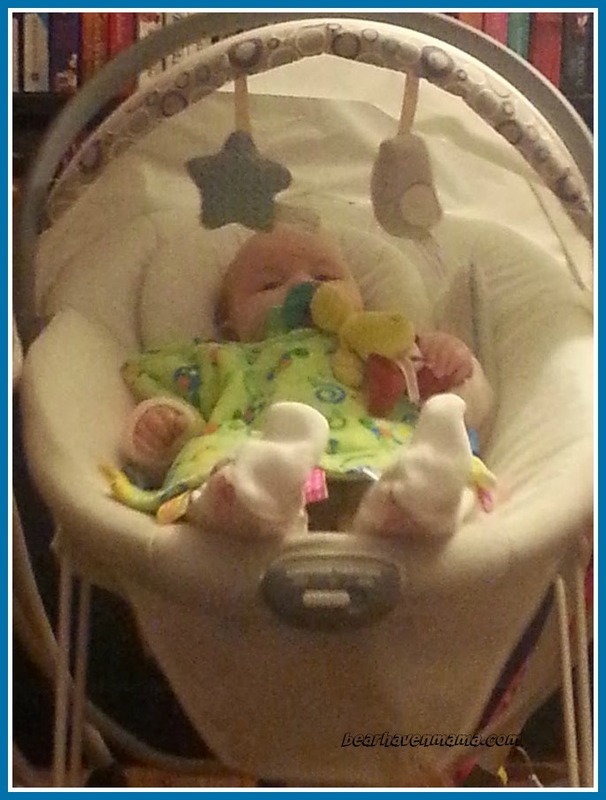 We put her in her swing with her Taggie and Wubbanub and play the Foster the People’s Torches album. It has to be that album and nothing else. Once she is asleep, we can get away with switching it to The Glitch Mob’s Drink the Sea album, but our choices are really limited. It sounds silly, but it works EVERY SINGLE TIME. I get an hour or two of time to make lunch, help kids with schoolwork, and check emails. I may be sick of that album, which used to be a favorite of mine, but it gets the job done and helps me with my sanity. When I had my son, he was a hard sell on nap time as well. I used to walk the mall almost every day with him and would go on long car drives (Thankfully gas was under two bucks at the time). We had just moved into the area when he was a little under 4 months old. By the time he was six months old, I knew my way around every back road in the county. Before my oldest daughter was finally diagnosed with acid reflux and we got it taken care of, my husband used to take her on nightly car rides. Once, we had her in her swing and were flipping through the channels while she was crying. We got to a station that was playing WWE Wrestling. She immediately stopped crying. While my husband and I are not wrestling fans, we settled in for the evening with that just because it made her happy. When I reflect on all of this, it sounds silly and sometimes ridiculous, but it worked. That’s the thing about parenting. We can read all the books and hear all the experts, but in the end, sometimes it is whatever works. For now, my daughter is napping every morning in her swing. I may not get her to nap in the afternoon, and night time is still sketchy, but for an hour or two every morning, I can get my coffee drank and school work done. Everyone is happy…okay, Bubby wants to go running as soon as he hears the music start up, but it works for us. What kinds of things did you do to make naptime work for you or make things run a bit smoother in your household with babies in the house?